ENTEBBE – Government has announced that a committee will be set up to investigate the incident at Entebbe International Airport where Ethiopian Airlines Flight No. ET 338, Boeing 737-800 overshot the runway upon landing on Wednesday morning. Addressing journalists at the airport on Wednesday afternoon, Works and Transport minister Monica Azuba said that investigation is a requirement by the International Civil Aviation Organisation (ICAO). “According to regulations and ICAO, we are going to set up an investigation team, I will be setting it up immediately to investigate what happened and what caused this,” she said. could have been caused by a quick drop in the air. “According to the flights pilot who was in touch with the airport officials, he informed the control Tower that they met an air pocket and missed the touchline forcing him to land a bit far off,” Ms Azuba said. She said flights, which had been halted after the Civil Aviation Authority (CAA) issued a Notice to Airmen (NOTAM) at 6:40 am temporarily stopping incoming flights from other countries resumed after the aircraft was removed from the runway at 10:15 am. “What happened is that when it went part of the tail was straight in line with the instrument landing system so it would be difficult for incoming flights to land at that time. People on the ground were in touch with incoming flights and fortunately many of them had not taken off from where they were and were all informed which delayed the flights” she said. The minister said the incident mainly affected the morning inbound international flights including Turkish airlines which had landed in Kigali, Kenya Airways, Egypt Air which was ready to take off in Cairo and Rwanda Air with the incidence also affecting some outbound flights. Ms Azuba said aircrafts of other operators that were on the ground before the incident were able to depart. The Managing Director CAA, Dr David Kakuuba, said the ministry will constitute the investigation team to find the cause of the incident and report of the full investigation made available to media. 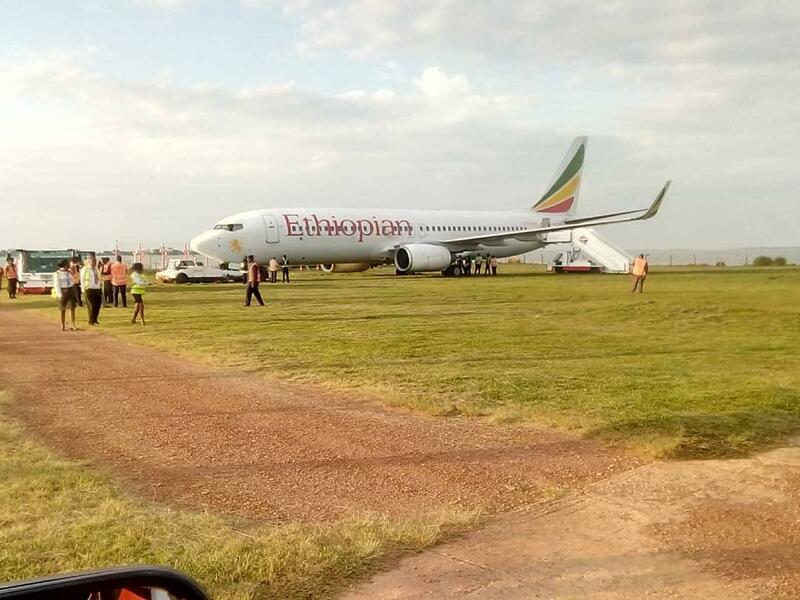 Ethiopian airlines country manager Mr Abebe Angessa said all 139 passengers that were aboard the flight were safely secured along with their property and booked into hotels in Entebbe to rest and recover.